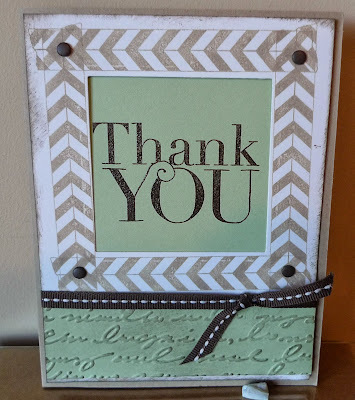 Karina's Kreations: Stampin'Up Tape It! I run a group called stamp set of the month. Every month I feature a stamp set and either mail you out three finished card samples or the kit to make the cards at home. The cost is $30.95 and includes a clear mount stamp set or product of your choice up to $30.95. You can be part of the club that shares hostess benefits or just buy them month by month. The stamp set of the month for September was Tape it and I made a video sharing some tips on how to make this card. Warning! The video is not perfect and I did make a few mistakes!! Tape It Thank You Card! 1. Fold 5-1/2” x 8-1/2” Crumb Cake card stock in half to make a base. 2. Place the 2-1/2” x 2-1/2” framelit on the 4” x 5-1/4” Whisper White card stock. Run through the Big Shot die cut machine. This creates a frame. 3. Stamp the Chevron stamp with Crumb Cake ink four times around the Whisper White frame. 4. Place 1-1/4” x 4” Pistachio Pudding card stock in the Print Print Embossing Folder. Lightly sponge Early Espresso ink over the raised lettering. Attach to the Whisper White card stock. 5. Wrap Early Espresso ¼” Stitched Grosgrain ribbon around the Whisper White card stock. 6. Stamp “Thank You” In Early Espresso ink on 3-7/8” x 3-7/8” Pistachio Pudding card stock. Emboss with Clear Embossing Powder. Attach to the card base. 7. Attach the Very Vanilla card stock layer to the card with Stampin’ Dimensionals centring the greeting. I hope you like my card and will try the stamp set of the month in October.